and supported by author David Wilcox and purported secret government agent Corey Goode, an alien city has been discovered 2 miles under the ice in Antarctica. All manner of claims are being made, including claims that Trump is about to make an announcement, tombs of giants have been discovered, alien technology has been found, and the city includes healing chambers. Note the images below are artistic renderings, not actual photos. The first scientific excavations of ruins from an ancient frozen civilization buried under two miles of ice started in Antarctica earlier this month. It involved a civilization led by 10-12 foot tall “Pre-Adamites” with elongated skulls. The Pre-Adamites were aliens who had arrived on Earth about 55,000 years ago, a fact determined with the discovery of three oval-shaped motherships, about 30 miles in diameter, at the site. Immediately after being unearthed, one of the three ships has been found to have many smaller spacecrafts inside. The Pre-Adamite civilization, at least part of it based in Antarctica, had been flash frozen due to a catastrophic event, roughly dated back 12,000 years ago. This was all supposedly discovered in 2002 by US satellites, and investigated. A magnetic anomaly was discovered. Per the Zetas, this is a magnetic signature that would be associated with metal in a city, so you heard it FIRST from ZetaTalk that the excitement around Lake Vostok was due to a CITY under the ice. During April 2001 one of the world’s great secrets was revealed: an ancient structure or apparatus that lay encased miles under the hard Antarctic ice was detected by a roving spy satellite. The US military immediately moved to quash the reports and the mainstream news media dutifully complied. Despite the news blackout, reports still surfaced that a secretive excavation project had commenced on the heels of the discovery. A magnetic anomaly formed, intensified, and spread to the vicinity of the Russian Vostok base. Meanwhile, the American military airfield buzzed with activity as flights came and went at a dizzying pace. Heavy machinery–some pretty exotic–appeared on the bleak Antarctic ice sheet. Unverified reports claimed that the nuclear-powered earth borer Subterrene arrived. The strange vortex phenomenon–a highly magnetic tunnel to the past–was code named The Time Gate by military intelligence. Then there was a flap in 2012 because a spaceport entry was imaged by Google Earth. The Zetas at that time stated this port was not used by humans. They were vague about whether the aliens were Service-to-Other or Service-to-Self. They were also vague about whether the spaceport was used by the Annunaki, which would by definition not be human. They stated emphatically that the ancient spaceport was not used by man. What is the clearly manufactured entrance into Antarctica rock, in the shape of a space ship? It is what it seems to be, an entrance for space ships. This port is not currently in use, nor would curious man find anything laying about that might be useful or educational. Who lived there? We have explained the plethora of alien life forms currently visiting Earth, and the myriad worlds they come from. It matters not what alien group found Antarctica convenient, as the history of visitations as explained by ourselves has covered the basics. Antarctica has never been inhabited by early man, so the space ports there were never under threat of discovery. This port nor any underground facility in Antartica was not, at any time, utilized by mankind, despite myths about Admiral Byrd or the Nazis to the contrary. maps such as the Piri Reis map, it was not an ice continent. The past several Pole Shifts changed that, moving Antarctic into the frost zone. Annunaki were all over the world, evidence of their past on every continent, so they certainly could have gone to Antarctica in the past. An unanswered puzzle that cartographers struggle with is the presence of ancient maps that indicate the equator and the poles were not always where they are today. The accuracy of these maps, detailing land masses and their placement as they are essentially known today, cannot be denied. These were not fantasy maps, but were drawn with markings that relate to the placement of stars and compasses, the guides sailors use when far out at sea. There is no ready explanation, as the detail and consistency do not indicate confusion, and a matter as central to map making as the placement of the equator and poles would not likely be confused. Pole shifts occur often, have occurred in recent time, and could occur again! The traditional media has reported that the Russian Orthodox Patriarch Kirill visited Antarctic a year ago, John Kerry went to Antarctica in November, per the Zetas to plant the US flag, and that Buzz Aldrin the 86 year old former astronaut also took a tourist trip there in December. We know that Antarctica will be prime real estate in the Aftertime, lying on the new Equator, but is there more to this picture? Were these visitors going down for a peek at what the city buried under the ice contains? Last February the Russian Orthodox Patriarch Kirill visited Antarctic, and per photos chatted with penguins. Now the US Secretary of State John Kerry is traveling there, leaving on November 7, the day before the elections, and returning days after. Supposedly this visit is to publicize climate change, but there is another agenda. Kerry has gone to plant the US flag and claim this pie slice! Why was Buzz Aldrin so intent on getting to the S Pole, in a group of tourists seemingly so intent on getting to Mars? Of course he could be considered to be enthusiastic about travel to Mars, just as he was about travel to the Moon, being by nature a buoyant and enthusiastic person. To say the trip is ill advised for someone at 86 years of age is an understatement. The trip was being pushed by Elon Musk and other Mars opportunists, who are looking for a massive infusion of funds to their endeavors. Ben Fulford mentions these Antarctica discoveries and mentions “healing chambers’ that elite humans in the Service-to-Self have been trying to access and be allowed to use. Ben Fulford reports info from many sources, and thus has been colossally wrong on occasion. He had Hillary Clinton dead after the 911 memorial in 2016, had Neil Keenan dead too which Keenan explained was due to Fulford drinking too much, and stated that MH 370 would soon be found in Japan. So where Ben Fulford has the trends right, and many of his reports are spot on, one must also consider Fulford’s sources. The source, who is a direct relative of a famous World War 2 Admiral, also had some X-files stuff to say namely that: “Two timelines are converging now and when that convergence is finished we will have full disclosure. This is why all of the major world leaders went to Antarctica, and continue to arrive every day. The ancient lost city is already in view. This is what I have been calling ‘The Base’ in earlier transmissions and discussions. Everything is there and the elites have been arriving by their special craft not only to seek protection from being arrested, but also to try and make a deal with the Galactics who are in control of the entire area now. There are those in the top ranks of the elite who are in “The City” now and attempting to make a deal to get into the healing chambers. Kissinger included. Per the Zetas, Fulford’s Antarctica source is wrong. The Zetas explain that they could not comment earlier on these Antarctica rumors as to do so would have required them to engage Service-to-Self aliens who had a disinformation operation going. Engagements between Service-to-Other and Service-to-Self groups are time consuming and the Zetas must consider their other endeavors. Per the Zetas, now that the 2016 US elections have been completed, the Service-to-Self aliens have nothing more to gain from investing THEIR time, and have abandoned the op. Thus, the Zetas can now comment freely. Despite disinformation being spread by Corey Goode and his cohorts under the influence of Service-to-Self liars, there will be no alien technology made available to mankind by any such discoveries. Treat this like Egyptian tombs, or Tibetan artifacts – revealing of past civilizations but not technology waiting to have a switch thrown. For the Service-to-Self to leave technology lying about, even abandoned on an ice covered continent, would be against the Council of Worlds rules, as we have stated on many occasions. Do the artifacts include Annunaki bodies? Awaiting cremation, yes, and abandoned during a past Pole Shift when evacuation became an emergency. Ben Fulford reported what a source told him, and Ben has on occasion failed colossally in his reports from various sources. He had Hillary Clinton dead, Neil Keenan dead, MH 370 found in Japan, and now reports about the Antarctica find. It is true we could not formerly comment on these finds, as to do so would be to engage the Service-to-Self. They have since abandoned the scam, which was to entice many humans such as Kissinger and the Clintons, operating in the Service-to-Self, into close consulting relationships with the aliens conducting the scam. Since Hillary lost the election and is under house arrest, and Kissinger is unwelcome everywhere, no more time is being devoted to them. is also located at present just above the Constellation Cetus, along the Ecliptic and just to the left of the Sun. 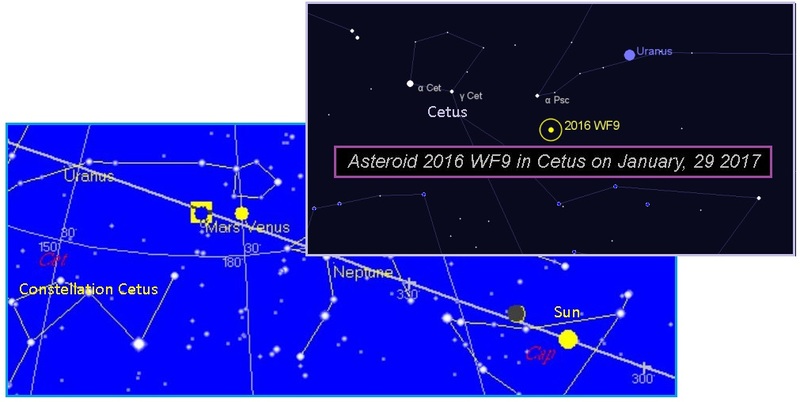 The object, known as 2016 WF9, is hurtling towards Earth and is being tracked by NASA. NASA says the object, which could be a comet or an asteroid, will safely pass Earth at a distance of nearly 32 million miles on February 25. But Russian astronomer Dr Dyomin Damir Zakharovich has said the space agency is wrong. Dr Zakharovich believes the object could hit on February 16 sparking catastrophic tsunamis and causing the planet’s seas to boil. The Russian says the mysterious object comes from the rogue planet Niburu, also called Planet X, on the edge of the solar system. The object they call WF9 left the Nibiru system in October when Nibiru began spinning counter clockwise around the sun. provides exacting coordinates for viewing, so amateurs can line up their scopes and peek away! After all, this asteroid is supposed to pass close to the Earth. Let the viewing begin! In addition to bringing up the word Nibiru, this brouhaha also brings in the concept of a retrograde orbit, that Nibiru has a retrograde orbit. The angle of the fireballs screaming into the Earth’s atmosphere matters, as asteroids do NOT come directly from the direction of the Sun. Asteroid 2016 WF9 is indeed an asteroid, but the fireball that was heading into Chelyabinsk in February, 2013 came directly from the Sun, and was a bolide from the trash in the tail of Nibiru. Clearly not an asteroid, the Chelyabinsk meteor came from the direction of the Sun, where Planet X, aka Nibiru, is wafting its vast debris ridden tail. Does the Chelyabinsk meteor usher in a new era of larger and more devastating fireballs descending upon the Earth? Without a question, and all will be coming from the direction of the Sun. So why the emphasis in Dr Zakharovich’s opinion on Asteroid 2016 WF9 changing direction FROM a retrograde orbit. Is it even relevant? It is now coming in a normal counterclockwise orbit. The emphasis is to present yet another term in the discussion that will lead to ZetaTalk. The Zetas Path diagram, presented in 1997, shows this turn in direction for Nibiru as it came inbound. The Zetas described the REASON for the turn to a retrograde orbit. Dr Zakharovich is CONFIRMING ZetaTalk thus, as well as confirming that Nibiru exists. Per the Zetas, this is all part of the gradual awakening that is part of the announcement process. of the Sun, which reaches out from the Sun as it rotates in a counterclockwise motion. The Sun rotates in this direction, and forces all the planets in the inner Solar System to orbit in this direction. Thus asteroids from the Asteroid Belt are likewise impelled to travel in a counterclockwise manner. Debris in the tail of Nibiru is on the increase, and after struggling to claim it is space junk returning to Earth or annual meteor showers or perhaps an asteroid, the media fell silent. which came from the direction of the Sun, vs Asteroid 2012 DA14, which tracked in on the Earth’s orbit just behind the Earth, both in their counterclockwise orbits, this discussion will tend to prove Nibiru’s presence near the Sun. As can be seen by photos of the Nibiru system, this tail curves out from Nibiru in a clockwise manner, a retrograde manner, curling under the Sun and thence up to the left. Nibiru itself also has a retrograde rotation. What will be the result of this Russian astronomer’s claims? More headlines with Nibiru in the title. More discussion on just what rotates in a retrograde manner in the Solar System. More awareness that the rash of fireballs and bolides afflicting the Earth are retrograde at their arrival. More examination of the history of asteroid WF9 in October to the present, and more “discoveries” in the news. that survived in the past, as most such crossbreeds reportedly die in infancy. No DNA analysis was ever done on these few hybrid survivors. Per the Zetas, Bigfoot is a version of early man, and is incarnated with transplanted souls from another world looking for peace and reflection. The Zetas have recently stated that BigFoot encounters will increase and be more obvious, as after the Pole Shift human survivors will likely be encountering Bigfoot groups and thus, a good relationship between Bigfoot and humans needs to be fostered. Has this increasing contact already started? Perhaps so! Remarkable footage of a Bigfoot family from a Yellowstone webcam has even hit the press in Russia. As the Earth’s Transformation is now, and due to the pending upheaval and crowded living spaces man and his peers in 3rd density may encounter each other, the Council of Worlds is allowing contact among these groups. Thus man may encounter Bigfoot, increasingly. A so-called “bigfoot family” has been caught on camera walking around Yellowstone National Park in Wyoming. The footage, which was filmed on Christmas Day, is a cellphone recording of a live camera feed near the Old Faithful geyser at the famous park. Although the video begins with two of the mysterious figures sitting down, they’re then joined by four others. Having clocked up almost 20,000 views, a vast number of people are of the belief that this particular sighting is indeed legitimate.